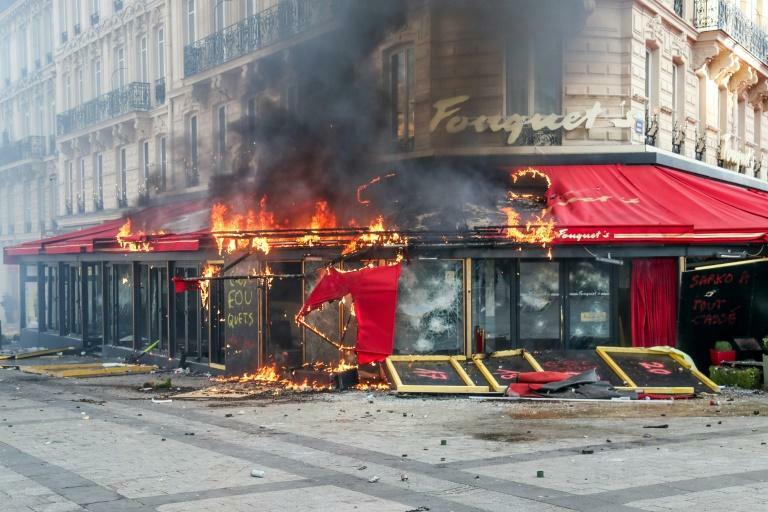 Rioters looted and torched shops and businesses on the famed Champs-Elysees avenue in Paris on Saturday, on the 18th weekend of French "yellow vest" protests, characterised by a sharp increase in violence after weeks of dwindling turnout. He vowed to take "strong decisions" to prevent further violence, following the emergency talks held at the interior ministry late Saturday. "There are people today who try by all means... to damage the Republic by breaking, by destroying things at the risk of killing someone," Macron said. "All those who were there were complicit in" the havoc spread across the Champs-Elysees, he added. The police appeared overrun as protesters swarmed the Champs-Elysees, vandalising and later setting fire to Fouquet's brasserie, a favourite hangout of the rich and famous for the past century -- as well as luxury handbag store Longchamp, a bank, another restaurant and several news stands. 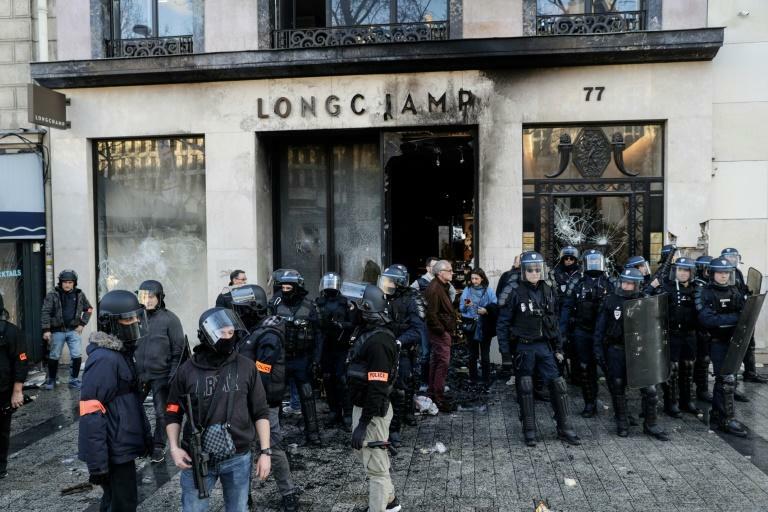 The rioters also looted several clothing stores and set fire to barricades in scenes reminiscent of the worst yellow-vest riots in Paris in December. "Like the vast majority of French people, I feel very angry today," tweeted French Prime Minister Edouard Philippe, who visited the scene. "Today's actions are not the work of protesters, but of looters, arsonists and criminals. No cause justifies this violence," he added. In a statement, the national police denounced the "mindless violence, cowardly attacks" and stressed their determination to guarantee public order against "provocateurs and vandals". 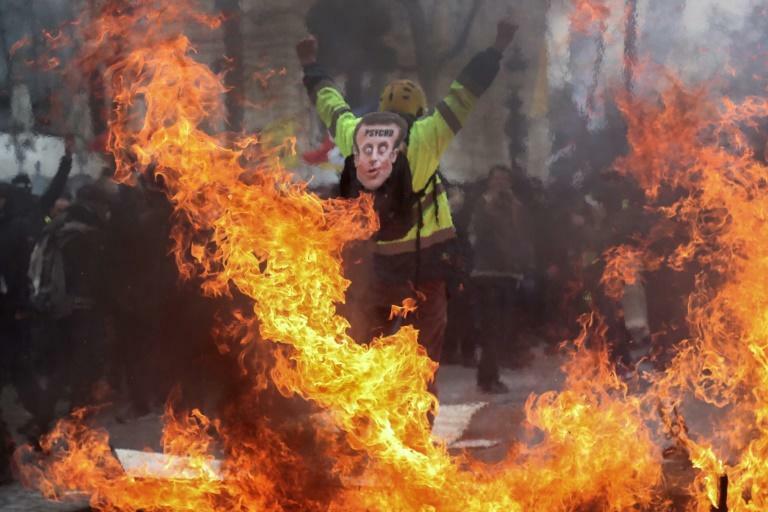 Saturday's turnout was seen a test of the ongoing strength of the movement, which began in November over fuel tax hikes and quickly ballooned into a rebellion against Macron's policies, seen by the protesters as geared towards the rich. In recent weeks, the protests have dwindled in size. But the interior ministry estimated the turnout in Paris Saturday at 10,000, out of around 32,300 nationwide. That is a fraction of the 282,000 people they said took part in the inaugural demonstrations across France on November 17, but more than the previous weekend. Saturday's protests were markedly more violent than in recent weeks. Police said close to 240 people were arrested, while prosecutors said more than 100 had been taken into custody. The bank set alight was on the ground floor of an apartment building, and fire firefighters had to quickly evacuate the residents, including a nine-month-old baby. Eleven people suffered minor injuries in the bank blaze, the fire service told AFP. The violence left 17 members of the police injured, and 42 protesters, said police. The rally coincides with the end of the public debates called by the president to try take the heat out of the protests and give voters a forum to propose policy changes. Around half a million people turned out at town hall-style meetings held around the country over the past two months. On Saturday, the police used tear gas, stun grenades and water cannon to try repel protesters who gathered at the foot of the Arc de Triomphe war memorial, which was sacked by protesters on December 1. But for seven hours they continued to be pelted with paving stones by mostly black-clad demonstrators. "There are a number of people who have come just to smash things," Interior Minister Christophe Castaner said, estimating that some 1,500 "ultra-violent" activists had infiltrated the crowd. "We have been too nice, that's why it's violent today. I'm not in favour (of violence) but we are ruled by corrupt people who dare to lecture us," Jean-Francois Bernard, a landscape gardener who was among the protesters, told AFP. The presidency later announced that Macron was returning home from La Mongie ski resort where he and his wife Brigitte arrived Thursday to spend the weekend. Protesters streamed into the capital by train and car for a rally they called an "ultimatum" to the president. Over 5,000 police were deployed, along with several armoured police vehicles. Macron was caught off guard when grassroots protesters began occupying traffic roundabouts in November over fuel taxes. He has loosened the state's purse strings to the tune of 10 billion euros ($11.2 billion) to try defuse the protests. The Paris protest was one of several in the capital on Saturday, where tens of thousands of climate campaigners also held a demonstration to demand that the French government uphold its commitments on reducing emissions. Yellow vest protests also took place several other French cities. At Bordeaux, in the southwest, police clashed with protesters and a bank was damaged.